Mali twice came from behind to draw 2-2 with Uganda while Zambia edged out neighbours Zimbabwe 1-0 in the opening Group D games at the African Nations Championship. Uganda captain Farouk Miya set-up and scored a goal before going off injured at half-time. While Isaac Chansa scored the only goal of the game to give Zambia their win. The next Group D games are on Saturday as Zimbabwe play Mali and Uganda face Zambia. Uganda opened the scoring after just 11 minutes against Mali in the Rwandan city of Rubavu when Joseph Ochaya headed home a freekick from Miya. Miya has impressed for Uganda in recent months in World Cup qualifying and at the regional Cecafa tournament. Mali dew level 12 minutes later through Sekou Koita, whose control in the area took him past a defender before he fired past Ismail Watenga in the Ugandan goal. Then four minutes before half-time Miya scored from the penalty spot for Uganda after Erisa Ssekisambu was fouled in the area. However there was bad news for Uganda coach Milutin 'Micho' Sredojevic at half-time when injury forced Miya to be replaced by Muzamiru Mutyaba. There was another injury blow for Uganda shortly after the break when goalkeeper Watenga pulled a muscle while taking a goal kick, with Mathias Kigonya coming on in his place. Mali equalised on the hour mark through striker Hamidou Sinayoko as he managed to get his foot on the ball and divert it into the net from a Mamadou Coulibaly pass. Two players who helped Zambia win the Africa Cup of Nations in 2012 combined for their win over Zimbabwe earlier on Tuesday. Veteran midfielder Chansa broke the deadlock just before the hour, stretching to convert Chris Katongo's free-kick to the back post. Although Zambia had more possession, Zimbabwe spurned a chance to equalise. Edmore Chirambadare was through one-on-one with the keeper just before half-time, but shot wide from eight yards. It was a first defeat for coach Kalisto Pasuwa with the Zimbabwe team, having a record of three wins and three draws going into the match. And Zambia's experience told in the end, with Chansa and Katongo combining to strike the decisive blow. The pair will have boosted their chances of a recall to the full senior team. 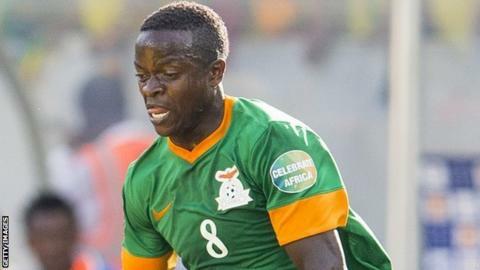 Before the match Zambia Football Association president Klausha Bwalya told BBC Sport he believes the pair still have a lot to contribute to the team. He said a good showing from them at CHAN - the tournament for locally-based players - could revive their international careers.